Personal property for sale to the highest bidder. Wilson Daily Times, 22 September 1928. Patrons of Oscar Reid‘s cleaning and pressing business may have been surprised to find their garments advertised for auction to satisfy liens against Reid. Edward C. Brewington, the lienholder, was also in the dry cleaning business. Nancy Gaston — The suit likely belonged to Mancy Gaston, who, though he lived in Elm City, worked in Wilson as a barber in Walter S. Hines‘ shop. Jessie Herring — in the 1930 census of Wilson township, Wilson County: farm laborer Jessie Herring, 34; wife Sarah, 36; and children Daziel, 13, Minnie, 12, Mary E., 11, Amos, 9, Maggie, 7, James L., 3, and Mary E., 1 month. Noro Jenkins — probably Nora Jenkins. 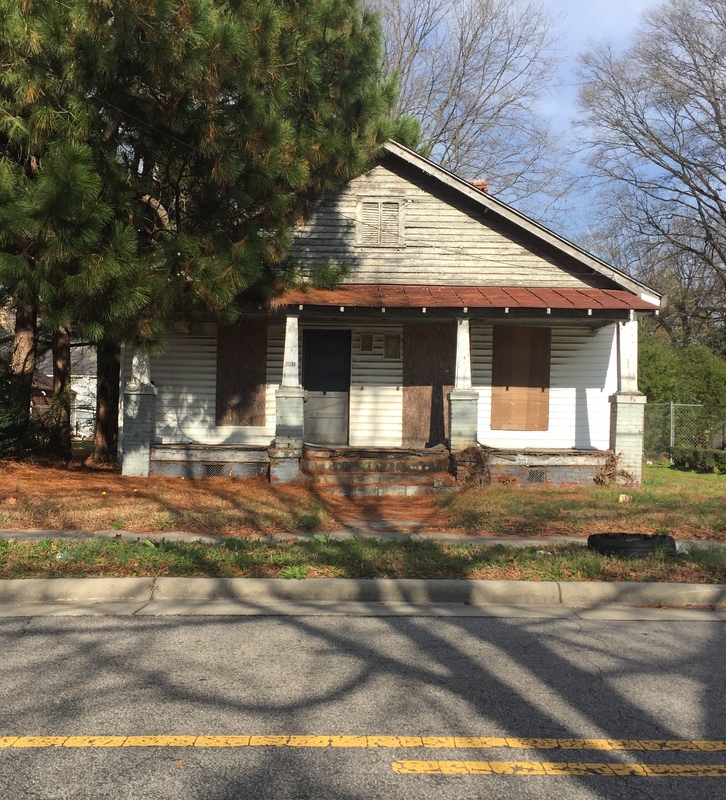 In the 1930 census of Wilson, Wilson County: at 610 East Green Street, John Jenkins, 41; wife Nora, 34; and children Howard, 18, John, 16, Robert, 12, Colonial, 8, Calvin, 5, Ida, Charlie, 3, and Rosco, 1. Wilson Daily Times, 25 November 1921. 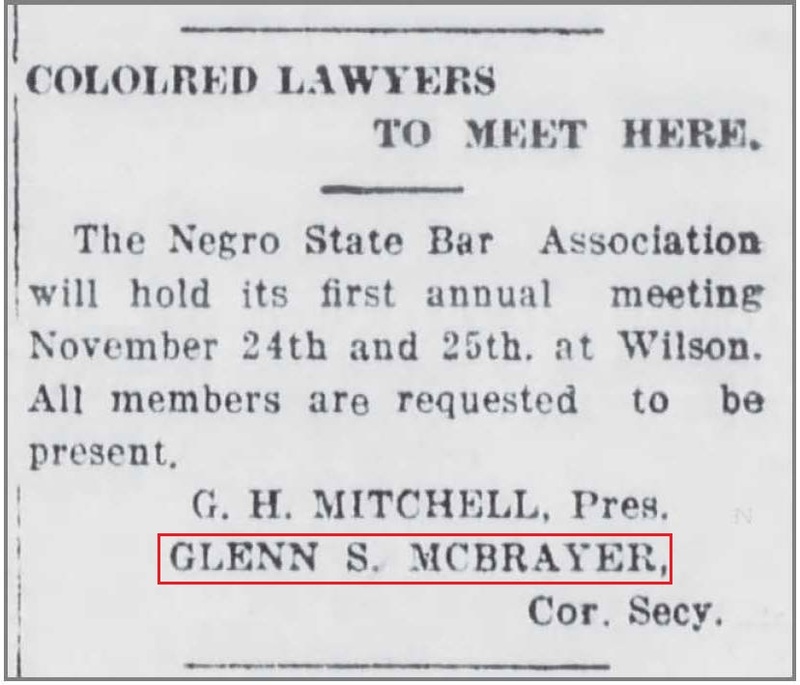 Glenn S. McBrayer was born about 1884, probably in South Carolina, to Randall and Sylvia McBrayer. He was reared near Shelby, in western North Carolina, and appears in Cleveland County in the 1900 census. Ten years later, he was listed as a 23 year-old farm laborer, but he was soon to make life-changing moves. Sometime during the decade he obtained a degree from Howard University. In January 1917, he married Lillie Brown in Zebulon, Nash County. Shortly after, he passed the North Carolina bar. The Crisis, April 1917, page 293. He appears in Wilson directories throughout the 1920s, but seems to have left Wilson after 1930. In 1934, Glenn and Lillian McBrayer are listed in the city directory of Buffalo, New York. His occupation is given as salesman.